Lune Valley Community Bee Keepers have been joined by volunteers and local wildlife experts to help improve the wildlife of the local area. This effort is part of the ‘Wildflowers for the Meadows’ project which has seen seven new pollinator patches created around Caton and the Crook O’Lune since 2014. These have helped provide a vital nectar network for insects. 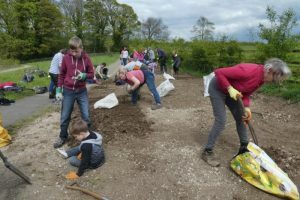 The project is delivered by local charity Yorkshire Dales Millennium Trust (YDMT) alongside the Forest of Bowland Area of Outstanding Natural Beauty (AONB), and the efforts from almost 70 volunteers have created a community verge boasting a wide variety of wildflower species.